Flights from Europe to the U.S. could take longer and be more expensive in the future as a result of climate change. Speaking at our May 2016 London Client seminar, “What’s on the Horizon?,” Dr. Paul Williams from the University of Reading warned that a doubling of the amount of carbon dioxide in the atmosphere would accelerate jet streams. The average winds along the flight route between London and New York are predicted to become 15% faster, making it twice as likely for a flight travelling from London Heathrow to John F. Kennedy International Airport to take more than seven hours. Meanwhile, flights travelling the other way will be twice as likely to reach their destination in under 5 hours and 20 minutes. It is interesting to note that the fastest ever non-Concorde flight time from JFK to LHR—5 hours and 16 minutes—was recorded in 2015 on a day when the jet stream was blowing at 250 mph. To study the effects of climate change on transatlantic flights, Dr. Williams’s team used computer models to map how atmospheric winds will be affected if the amount of carbon dioxide in the atmosphere reaches double pre-industrial levels. They then fed the results of this simulation into a routing algorithm of the type commonly used by flight planners. “The jet stream encircles the globe, and there is one in the southern hemisphere, too. 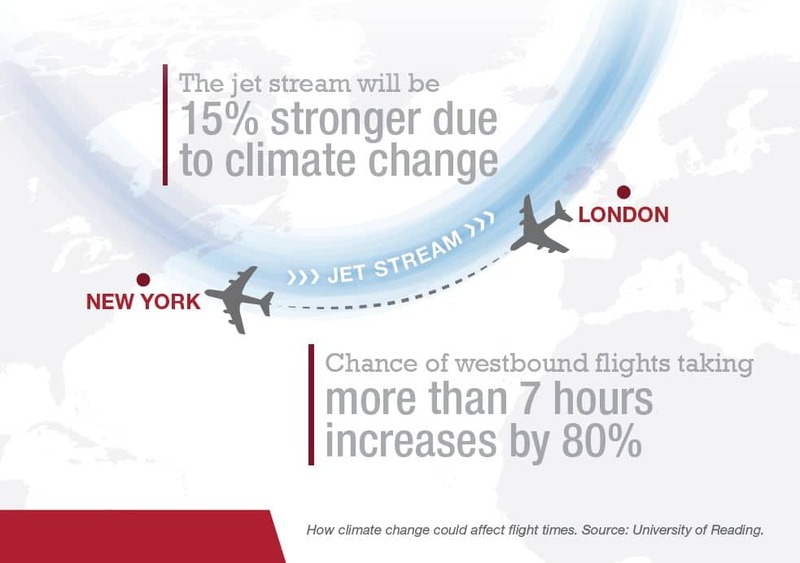 It is possible that flights elsewhere in the world will also suffer from a similar jet stream effect.” Airlines may have to alter schedules to reflect the greater differences in outbound and inbound flight times. But there is another potential impact of climate change on air transport and that is the frequency with which aircraft encounter clear-air turbulence (CAT). FAA data seem to indicate that the number of incidents per flight has been increasing, and as insurers we regularly have to deal with injury claims caused by severe CAT events, so this could be a worrying trend. In order to try to predict the effect if CO2 is doubled, Dr. Williams’s team have run simulations on multiple different models and compared them to determine the most likely outcomes. They found that for cruise altitudes in winter over the North Atlantic, most measures show a 10 – 40% increase in the average CAT strength and a 40 – 170% increase in the volume of airspace containing moderate CAT.